Save Marinwood-Lucas Valley - our community, our future: San Diego's enlightened Leash Optional parks. San Diego County has "off leash" areas in their parks everywhere. All dogs shall be maintained on a leash not to exceed eight feet, including trails and canyons in all parks. For those parks that have been designated dog off-leash areas, dogs must be leashed until inside the posted boundary for the off-leash area. Dogs benefit by being protected from rattlesnakes, ticks, traffic and various other hazards and distractions. Also, poison oak is spread from dogs to humans. We understand that people love their dogs and want a place for them to run free, play fetch and socialize with other dogs. 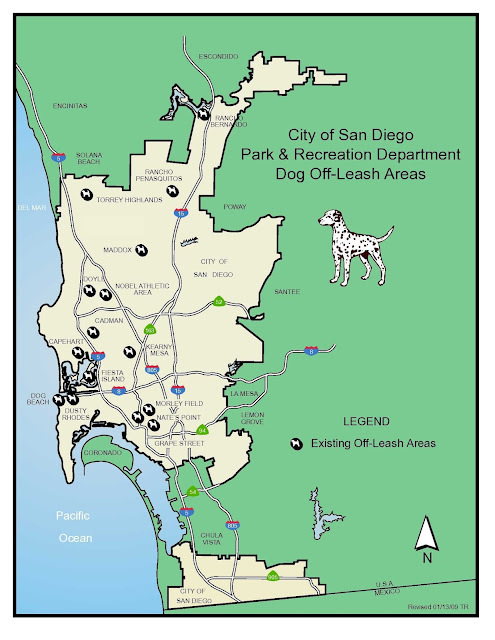 The City of San Diego has designated off-leash dog areas for just this reason. It is necessary to keep your pets within the boundaries of the posted "Designated Dog Off-Leash" areas. The perimeters may be unsafe for your dog (ex. traffic, sharp objects that can injure them). be sure that your dog is wearing a current license from the County Department of Animal Services. Why does Marin need so many off-leash areas? Everyone has yards.